Lutosławski reached the front cover of Radio i Świat in April 1948, shortly after Fitelberg had conducted the premiere of the First Symphony with the Great Polish Radio Symphony Orchestra in Katowice. Lutosławski’s downcast and invisible eyes seem to indicate a certain wariness, far removed from the matinee-idol poses of some of his contemporaries. It is a telling image of the time. During the 1940s and 1950s, Lutosławski’s income as a freelance composer of concert music was unreliable. He consequently was compelled to accept commissions for a wide range of music, some of which were palatable, some of which went against the grain. The most substantial source of work was Polish Radio, where Lutosławski wrote a great deal of incidental music, some for poetry programmes, some for short or full-length dramas. It is indicative of the still-tolerant relations in 1947 between the State and the Church that, on Christmas Day, Polish Radio broadcast a programme called Bethlehem Stars. This selection of seasonal verse by five poets (including Kazimiera Iłlakowiczówna, who furnished the poems for Lutosławski’s Five Songs of 1957) was accompanied by short interludes by Lutosławski for flute, clarinet and string trio. Lutosławski’s contribution to the genre of radio drama was substantial (over forty productions), although only in the post-Stalinist years did he write large-scale scores. These were for dramatisations of Polish classics: Mickiewicz’s Forefathers’ Eve (1955) and Słowacki’s Lilla Weneda (1959). 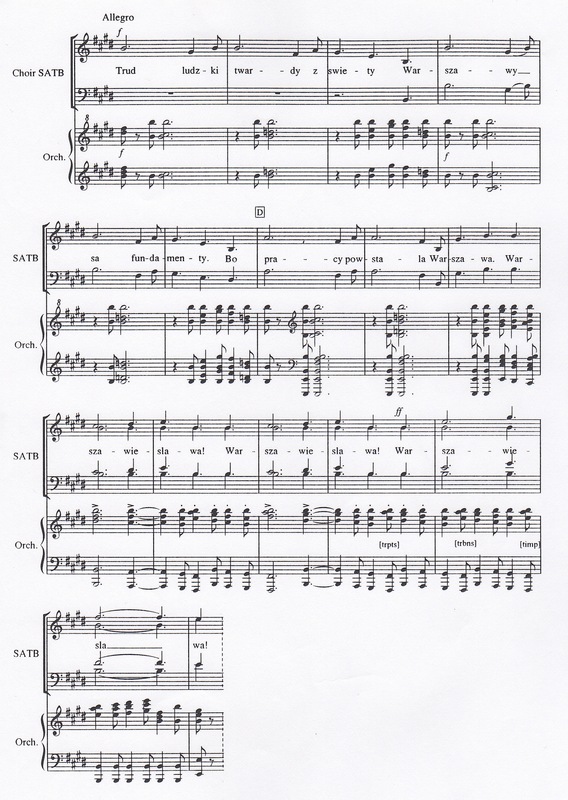 In other cases, Lutosławski’s incidental music consisted of short fragments, thoroughly workmanlike but modest in scope when compared with his published music. Among the sketches, parts and short scores now in the Paul Sacher Foundation in Basel is music to texts not only by Polish writers but also by foreign authors, all of this latter group dating from before the ‘Iron Curtain’ materialised. These broadcasts included Paul Valéry’s Soul and Dance, partly based on Socrates (1946), an excerpt from Ernst Hemingway’s For Whom the Bell Tolls (1947) and Carlo Goldoni’s Mirandolina (also 1947). Two programmes which drew on the Cornish legend of Tristan and Isolde (The Magic Potion and Flowers and Thorns) were broadcast in April and May 1947. Lutosławski prudently steered clear of Wagnerian associations in his score for small chamber ensemble. There were also several programmes for children, such as Not far from Kulik (for younger children, 1947) and Kipling’s The Cat that Walked by Himself (for older children, undated). Elsewhere in Lutosławski’s output of incidental music, it is worth noting Bracia (Brothers, 1947), a 40-minute play about sacrifice and freedom, set on the Ukrainian front at the battle of Lenino in 1943. Prawda o Syrenach (The Truth about the Sirens) was one of Lutosławski’s earliest commissions for incidental music. It was broadcast on Polish Radio in March 1947. Its author was Zofia Zawadzka, who had written lyrics for two of lutosławski’s wartime underground songs (precursors, like his Hasło uczniów, of the later mass songs). Lutosławski’s music for Prawda o Syrenach is interesting not least because it appropriated tunes from other sources. A young man searches for Odysseus and for the truth about his encounter with the Sirens. On his journey, the young man also meets Circe and two Comrades. 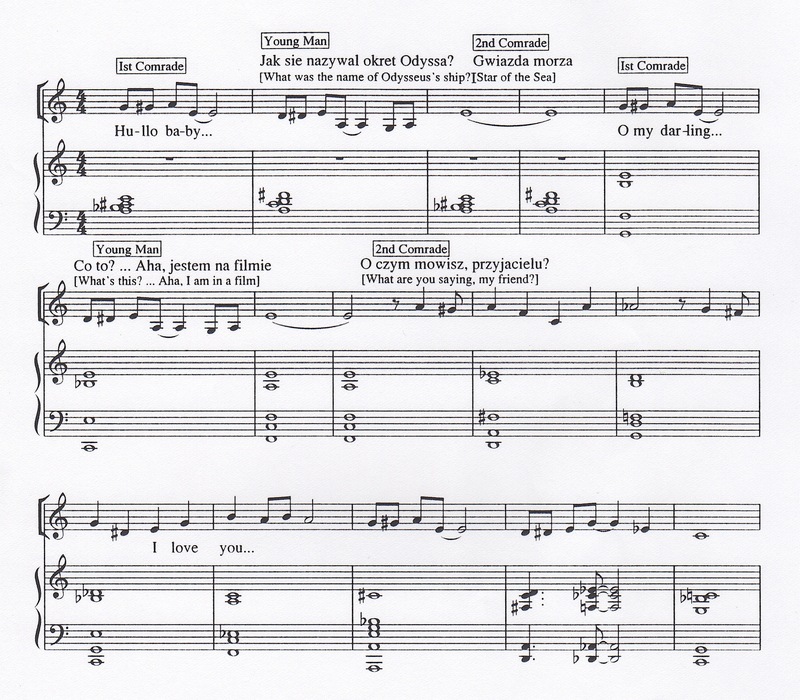 At the point where the young man meets Circe, Lutosławski’s copy of the typescript is annotated with a reference to an unidentified melody from Verdi’s opera La Traviata. [added 2013] Here’s a recording of Nobody Cares If I’m Blue by Annette Hanshaw. I don’t know if Lutosławski knew the song in this 1930 version or in another. Perhaps he or Panufnik had arranged it and played it at their café concerts during the war. Fletnia chińska (The Chinese Flute) is Lutosławski’s only verified piece of incidental music for Polish Radio in 1949 (9 February). It was a 20-minute programme of contemporary Chinese verse which included an opening poem on the musical beauty of the Chinese language and three poems by Wen Yi Tuo, who had been shot by the Kuomintang in 1946. That trumpet keeps on playing. They’re coming, the reds are coming. The sun rises earlier here. 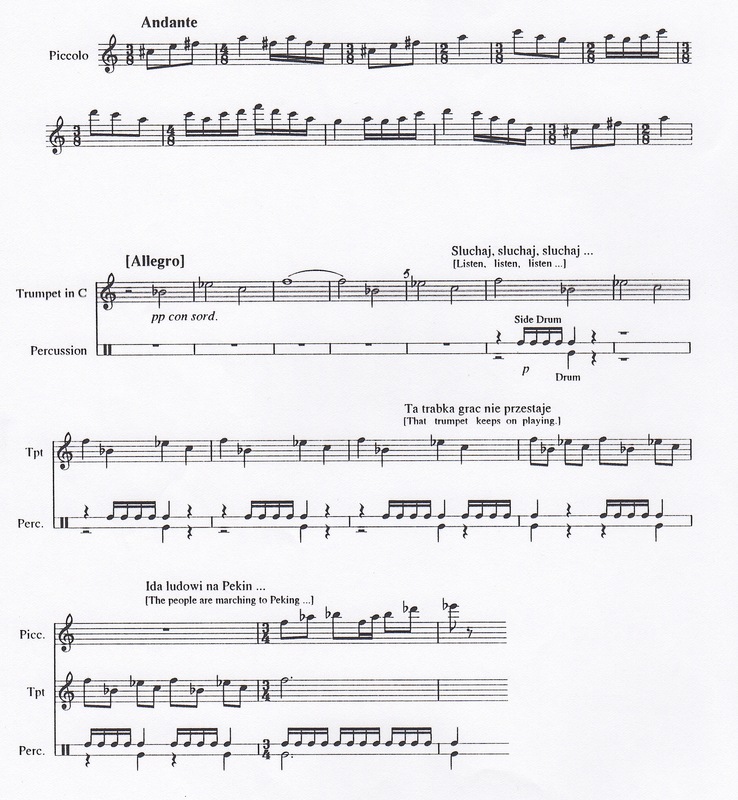 Lutosławski’s score consists of ten robustly pentatonic musical fragments, from which nos 4 and 10 are illustrated here (transcribed from Lutosławski’s manuscript). Lutosławski also provided music, apparently no longer extant, for at least two other politicised (and so far undated) radio programmes. 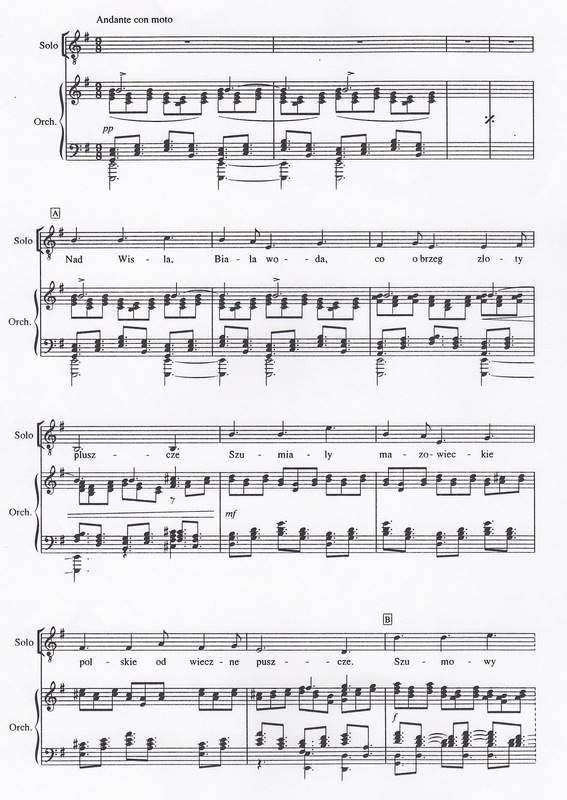 The music was to accompany poems by Stanisław Ziembicki Pieśń pokoju (Song of Peace) and Stanisław Wygodzki Pieśń, co zrodziła się w walce (Song Born in the Struggle). Lutosławski also set poetry by Wygodzki in three of his mass songs. 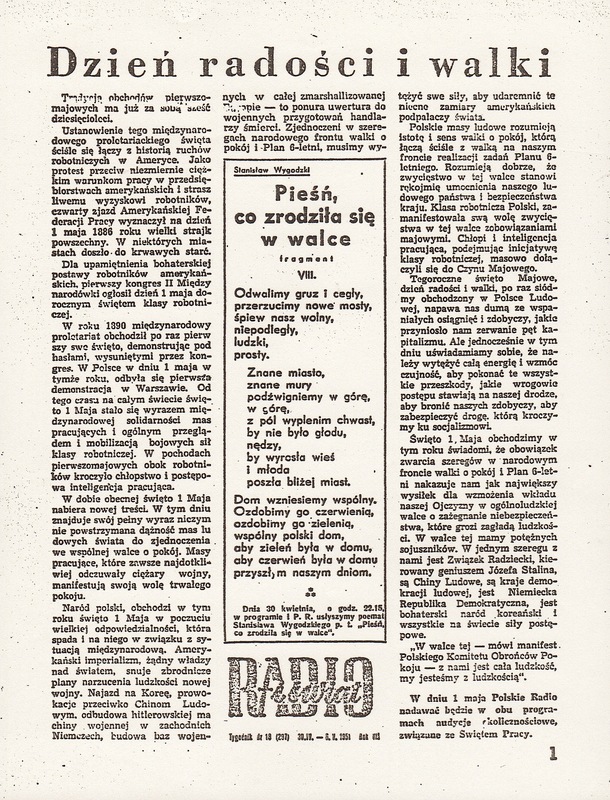 A fragment of Pieśń, co zrodziła się w walce appeared in Radio i Świat at the end of April 1951 under the editorial banner Dzień radości i walki (Day of Joy and Struggle = May Day). Whether Lutosławski’s music was for this or another broadcast of Wygodzki’s poem is not clear. This short cantata for tenor soloist, choir and orchestra was broadcast on Polish Radio but never published. A recording by the tenor Leopold Nowosad and an unnamed choir, orchestra and conductor resurfaced during my researches at Polish Radio two years ago. The text is by Ewa Szelburg-Zarembina. Given its message about Warsaw’s indomitable spirit in the face of attack and destruction, its concluding reference to ‘Peace, the Great Builder’ (ominous overtones of Stalin? ), and the participation of Nowosad (who was particularly prominent in the years immediately after World War II), Warszawie-sława! probably dates from the late 1940s or very early 1950s. The rebuilding of Warsaw after the war was a major task and preoccupied everyone in the capital. 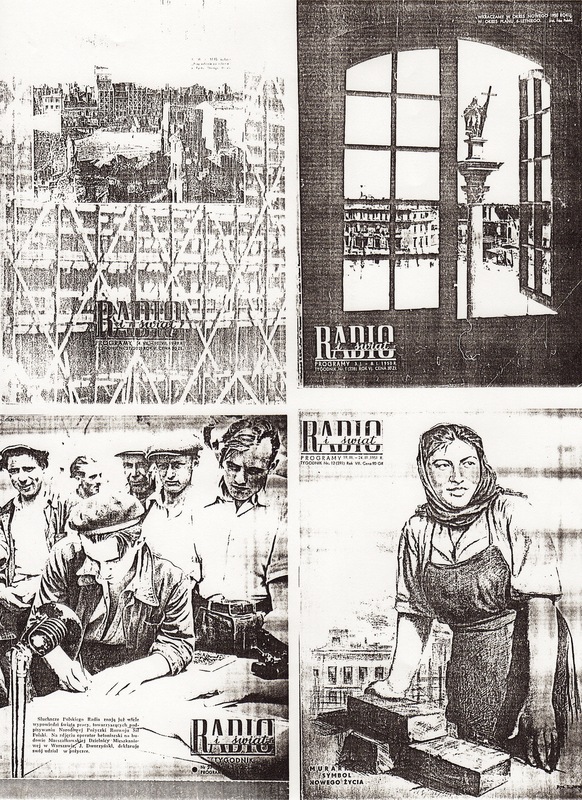 From 1949, front covers of Radio i Świat included photographs of the Old Town Square, blown up by the Nazis, and the King Zygmunt Column outside the ruined Royal Castle (‘We are entering the New Year of 1950 and the Beginning of the Six-Year Plan’). By 1951, portraits of musicians had been replaced by those of Polish workers: a drawing of a female bricklayer (‘Symbol of New Life’) was followed by the photograph of a young man, J. Dworzyński. He was the operator of a concrete-mixer on the site of the Stalinist flagship development known by its initials MDM, a residential and shopping complex in central Warsaw. Dworzyński is declaring his support for the National Loan for the Development of a Strong Poland.